« A library interlude - too cute! Courage is the most important of all the virtues, because without courage you can't practice any other virtue consistently. (Maya Angelou, quoted in http://www.brainyquote.com/quotes/quotes/m/mayaangelo120859.html. What do these authors mean by this? Do they mean we all have to be Gryffindors, or, heaven help us, Dauntless, in order to be good people? And is it even true? Do you have to be brave before you can be consistently loving, or generous, or humble? Couldn’t it work the other way around, so that practicing one of these other virtues could lead you to bravery? Yes, I think it could. C.S. Lewis himself wrote a remarkable scene in a novel for adults – a scene of resolute heroism on the part of a very young, very frightened woman. It wasn’t until I read another scene, in Elizabeth Wein’s brilliant, harrowing Rose Under Fire, that the scene Lewis had written truly clicked into place for me. Thinking of the two scenes together made me see courage in a new way. Warning – there are some spoilers ahead for both Rose Under Fire and Lewis’s adult novel, That Hideous Strength. 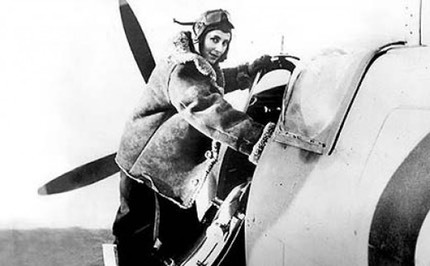 Rose Justice, an American air transport pilot, is just about 18 or so when she is captured by the Luftwaffe and brought to Ravensbrueck. The Luftwaffe pilots who capture her are impressed by her bravery – Rose was caught while pursuing a buzz bomb in order to knock it from the air – and they promise her good treatment. At first, she gets it. She works at the Siemens plant, in better conditions than most women prisoners. But then she finds out what she’s doing. She is making electrical relays for buzz bombs. This struck me very much as I read it – Rose keeps imagining a small boy’s hands being blown up by this fuse. She also remembers her friend’s terror of buzz bombs, and her fury that led her to try to knock one from the sky. It’s all of a piece – all her experiences in the war so far lead her to this moment of refusal. She accepts physical punishment, threats on her life, the loss of her job, and the torments of Ravensbrueck as the price of that refusal. And still she insists that she isn’t brave or noble. And Jane said nothing, partly because she could not speak, and partly because she now knew beyond all doubt that these were the enemies of the human race whom the Director was fighting against and one must tell them nothing. She did not feel brave in making this decision . . .
‘Where had you been by that train?’ said Miss Hardcastle. And Jane stared as if her eyes would start out of her head and said nothing. Then suddenly Miss Hardcastle leant forward and, after very carefully turning down the edge of Jane’s dress, thrust the lighted end of the cheroot against her shoulder. After that there was another pause and another silence. When I first read this scene, years ago, I actually didn’t notice how brave Jane is. She, herself, doesn’t think of herself as courageous – no more than Rose does in the earlier scene. But, like Rose, Jane makes an instantaneous decision and sticks to it. She endures torture – perhaps for hours; she cannot remember for how long – rather than betray her friends. The reason Jane’s heroism passed me by when I first read this scene as an adolescent is simple. Jane (who is physically a small, slender young woman) is utterly terrified. She finds Miss Hardcastle ogrish, and she offers only passive resistance to her. This is not our culture's picture of heroism. But Jane makes an ethical decision and sticks to it even under torture. Jane and Rose would have been no more heroic had they offered smart comments, physical resistance, and the like. What they do is effective, and it’s very, very brave. The other thing I noticed, especially when I read Rose’s scene: both these young women are acting from the core of their beings. When faced with a clear ethical choice, they react in a unified way – thought, imagination, and their physical beings are all one. Their courage is active; it involves the body. That’s why it’s called physical courage, as I finally understood. It’s not a matter of risk taking, or not fearing pain. It’s a matter of acting from one’s center. One’s whole self – body, mind and soul – are united in the act. There’s a word for this sort of unity of response in the face of an ethical choice. That word is integrity. And that is what Rose Justice and Jane Studdock both display. When I realized this, and went back to the statements Mr. Lewis and Ms. Angelou made above, they suddenly made much more sense to me. “No other virtue can exist without integrity” – somehow, I can accept that. I also believe that this sort of integrity can arise from love – love of friends, of family, of a little boy hunting shrapnel on the streets of London. It is because of their love, IMHO, that Jane and Rose are so brave. When I read about the daredevils in Divergent, I don’t get the sense that any of them are acting with integrity, nor that they are trying to protect other people. The Dauntless just don’t seem brave to me. Not in comparison to these young women. What do you think? How would you define physical bravery? And who’s the bravest character you’ve ever read about? Mrs. Dubose? Rose Justice? The astonishing young Telemachos, from another of Elizabeth Wein’s books? Or someone else? Personally, Sam Gamgee is my hero, but I love Jane and Rose, too!